Raleigh Bicycles grab two outstanding awards, Bicycling magazine's Editor's Choice Award and Outside magazine's Killer Value award. 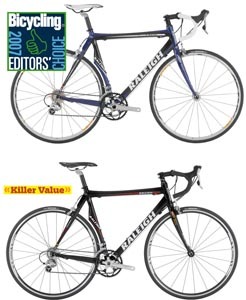 The Raleigh 2007 Competition was viewed by Bicycling's editors as the best "Recreational Road Bike" and the Raleigh 2007 Supercourse took the honor of being Outside's "Killer Value" choice in their Road Bike category. "Raleigh's Competition became our top pick for its 'great steering and really, really intuitive handling.' We also praised 'a ride that bikes twice its price would envy,...'" Bicycling's test editor's said. And Outside's test editor commented, "The frame is the same one Raleigh's sponsored riders race, and you can tell: Stand up on the pedals and the lively Supercourse seems to take off from underneath you." Both the Competition and the Supercourse use the totally redesigned 2007 Raleigh A.C.E. Evolution/Direct Connect carbon road frame. Weighing in at 1 kilo (960g for a 57cm) - this road frame holds a unique stiffness:weight ratio making this frame the lightest and most durable frame Raleigh as ever made. The Raleigh A.C.E. Evolution frame is also available on the 2007 Prestige model and as a Team frame and fork. Raleigh America, Inc., based in Kent, Wash., is one of the world's leading suppliers of road, mountain, comfort, and recreational bicycles and accessories. For more information or to find a Raleigh America dealer, call toll-free 800-222-5527 or visit www.raleighusa.com.